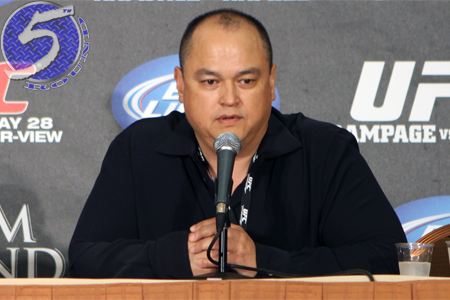 This is starting to become old hat for Strikeforce CEO Scott Coker (Pictured). After another one of his superstars flunked a drug test, Coker was forced to issue a generic statement for Muhammed “King Mo” Lawal that was similar to the one he released for Cristiane “Cyborg” Santos’ earlier this month. “Strikeforce has a strict, consistent policy against the use of any performance-enhancing drugs, including the requirement that all incoming athletes be tested and cleared for PEDs,” Coker expressed. “Therefore, we fully support the drug testing efforts of the Nevada State Athletic Commission, and we will fully cooperate with the Commission regarding the matter pertaining to Mr. Lawal’s test. On Tuesday morning, the Nevada State Athletic Commission reported Lawal tested positive for the steroid drostanolone after his 2ndRound TKO win over Lorenz Larkin. The talkative wrestler has vehemently denied using any illegal substance for the January 7th contest. Barring a successful appeal, the former light heavyweight Strikeforce champion faces a year-long suspension, $2,500 fine and having his victory overturned to a no contest.